One thousand Gazan dead,another three thousand born. The signs of Allah’s greatness keep on occurring. During the recent Israeli attack that had killed 1500 Palestinians, Allah made 3700 babies appeared. “If they killed a thousand of us, then we will bring on thousands more as their replacements,” thus a mother in Gaza said. In contrast to the mentality of the Zionist-Jews forces who are known to be afraid of death, giving birth is a part of Jihad for the Gazan citizens. Due to that, death is not a thing that they cry over. If there are phrases that say, “One gone, a thousand emerged,” then in Gaza what happened was “One thousand Gazan gone, three thousands more appeared”. The sorrow of the Gazan citizens over the death of 1412 sons and daughters of Gaza, was straight away soothed by Allah SWT with the birth of 3700 babies. Interestingly, they were all born within the 22 days of Israeli attacks on this small city. Hamam Nisman, the Director of the Social Communication Service in the Health Ministry of the Gazan government said that in 22 days of Israeli attack, a total of 3700 babies were born in Gaza. “3700 babies have been born between the 27th December 2008 and 17th January 2009 when Israel launched assaults that had caused the death of 1412 Gazan citizens, in which the majority of them are made up of women and children,” he said. In January alone, the number of birth is the highest ever being registered compared to the other months preceding it. 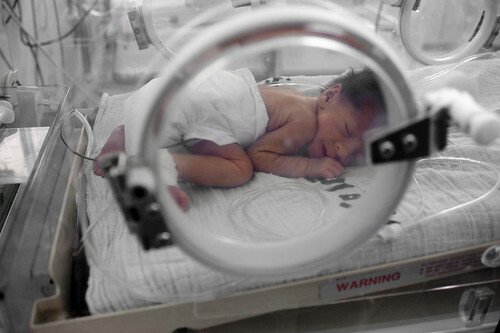 “50 thousands cases of birth are recorded every year in Gaza, and in each month around 3000 to 4000 births are recorded. However during the 22 days of Israeli attacks, we recorded 3700 number of births and for the rest of January, 1300 number of births were recorded. This means that there was an increase in the number of births in the month of January till it reached 1000 cases,” he said as cited by islamonline.net. “This is a ‘karomah’ for the people of Gaza, who had lost a lot of souls,” he expressed full of happiness. According to him, if the numbers of death and birth in Gaza are compared , then the number of birth reaches 50 thousands whereas the number of death reaches 5 thousands every year. “Israel is deliberately killing the women and children in order to destroy the future of Gaza, 440 children and 110 women had been killed and 2000 children as well as 1000 women were wounded,” he revealed. The Al Yarmuk street, west of Gaza city had lost 15 of its residents during the Israeli attacks. However they now have received 30 newborn babies, born during that period. It seems that Israel will keep on confronting the demographic problem of Palestine, where the number of birth in the country is increasing after the war occurred. Ummu Ahmad, the mother of 4 children affirmed the matter. The statistics showed that in the last 10 years, there was an increase in the number of population in Gaza, from 1 million it now becomes 1.5 millions. It means that the increase has reached 50%. If Gaza contributed 36% into the total population of Palestine in 1997, now the population of Gaza makes up 40 % of the overall population of Palestine. It is estimated that by the year 2025 the citizens of Palestine would reach 6 millions. It is this growth that worries Israel. Urnun Suvir, a lecturer at the University of Haifa wrote in his latest book, that the increase in the number of Palestinian population would threaten the strategy of Israel and endanger the existence of “Israeli State”. Israel can anytime make their plan, however the fact is that the plan of Allah is far more formidable and greater.